It was great to have a visit from Simon Cook the Principal of Mid Kent College when he visited me at home for one of our regular meetings discussing the education of our young people here in Medway. Like me, Simon is passionate about giving every young person in Medway the opportunity to excell and to make the most of the opportunities on offer to them here in Medway . 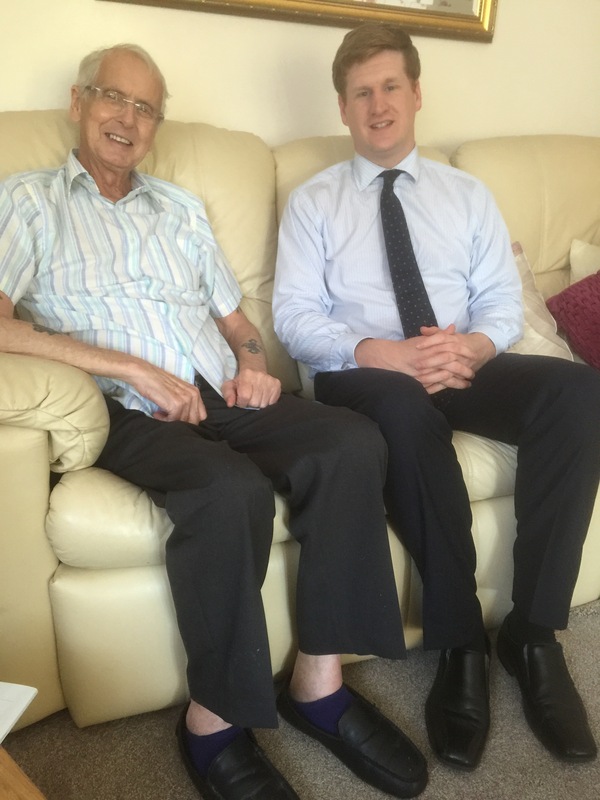 Last week I was visited by our brilliant PCC Matthew Scott who visited Sheila and I at home. Having been involved with Medway’s young people for so long, I was really taken back by the passion and energy he brought to the challenge. We’ve been lucky here in Medway that partners have always championed partnership working through action and not just words. But, that shouldn’t quell my excitement to see Matthew write another chapter for our Children’s future. Wishing everyone within the schools community, a very happy and well deserved Summer holiday. Students and teachers don’t quite often see eye to eye, when it comes to what constitutes a fair amount of homework or what might count as being late. However, we are at that rare time where student and teachers collectively count down their last few lessons and relish with no small amount of satisfaction, their upcoming summer holidays. As tempting as it is however to look at the upcoming holidays abroad or long lie-ins in bed, we have an ideal opportunity to look back as well as forwards. Collectively, we as a community have refused to be complacent, we have fought for each and every school, looking to promote best practise, excellence and above all our children, who a portion of will be leaving school for pastures new. Medway, has long had an industrial tradition, and to the many students who will be taking up apprenticeships they will be following in the footsteps of students who for nearly the entire history of Medway have been an indispensable backbone of the work force who worked on the ships that fought against the Dutch invasion of Chatham, to today where BAE systems is an avid investor of our local young people. As anyone who follows this blog knows, I couldn’t be prouder of those who leave Medway, to go to Universities nationally and indeed internationally, I know that each and every one of them are the greatest ambassadors to Medway that we could possibly ask for. Whilst, it was some time ago, I remember sitting my exams and that apprehension knowing how long you have to wait for the results. My thoughts are with you all and I hope that however fantastic your results are, they are in part, an opportunity to go on to achieve even more outstanding things. With that, I’d like to wish everyone within the schools community, a very happy and well deserved Summer holiday. We are fortunate to have so many talented and able people in the Conservative Party. Over the past few weeks, we’ve seen the high calibre of those candidates who have put themselves forward for the highest position in our country. For me there was only one clear choice. There was only one person who was ready and able to offer us the strong and stable leadership we need at such a crucial time for our country. That is why I am glad that Theresa May is our next leader of the Party and next Prime Minister of the United Kingdom. Theresa May has the qualification required for high office. She has a proven track record having held the position of Chairman of the Party and is the longest serving Home Secretary in over a century. Time and again she has shown her ability to command and negotiate and if anyone can get the best deal for Britain with the EU, it will be here. Theresa May is also a unifier, who can bring people together under her vision of a country that will work for everyone. And she is always willing to get stuck in and get the job done, just like the time she visited Gillingham in the cold winter to campaign with the local Conservative candidates. At a time of uncertainly for our country, we can rely on the judgement and leadership of Theresa May and I fully endorse her as our next Prime Minister. Hi, Mike,We are looking forward to welcoming you back to the farm this afternoon. The sun’s shining, church bells ringing, it’s a lovely start to a day in the country. Mrs. Ducky had a quieter day yesterday. As the weather was so wonderful, our fishing lakes were full of fishermen & their families & there were a few too many people around for her liking. So, she kept a low profile & stayed safe inside the tree, only coming out briefly later on in the day, when it was a bit quieter. 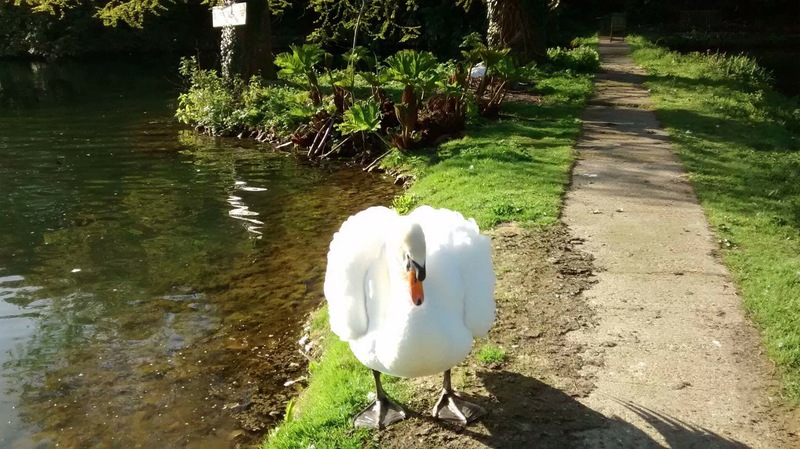 The swan is on high alert, however, and followed me all round the lake edges in the evening, while I was cutting the grass. 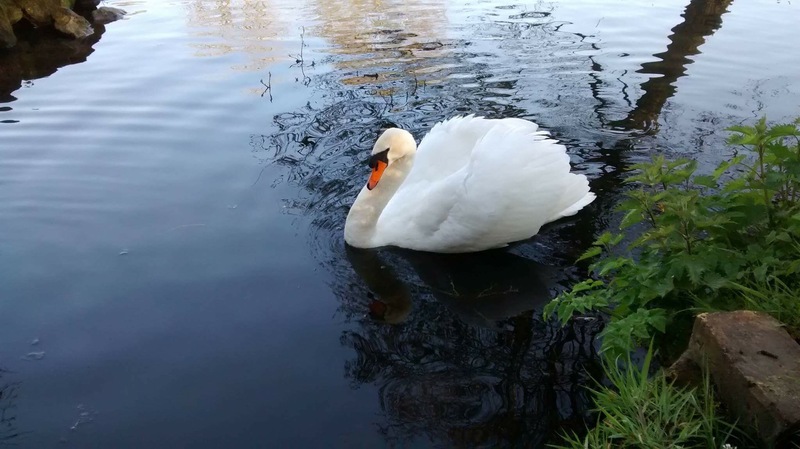 I’m his number one target, as I take food over to his mate at the nest site & if he can see me, will attack remorselessly…We have to be sneaky & feed him round the corner, then I can sneak over to the causeway & give her some grain while he’s not looking! 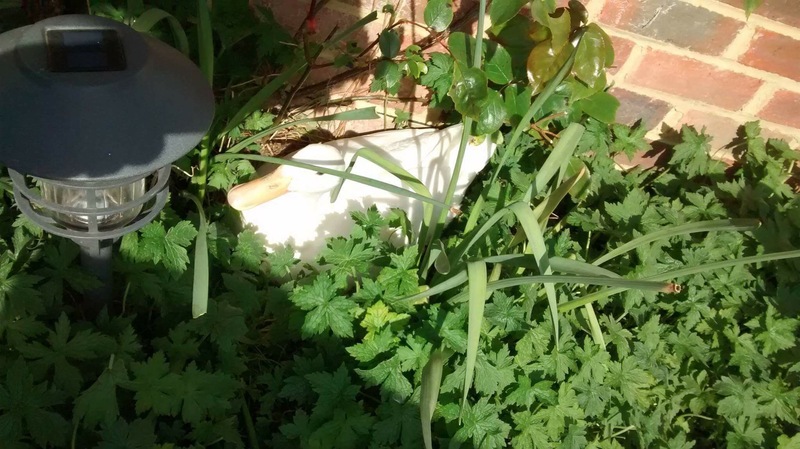 Anyway, Mrs. White Duck is busy laying her egg for the day as I’m writing go you, not best pleased that I’m having breakfast outside, I’ve messed up her privacy…..I can’t win, it’s very busy in the world of wildlife! 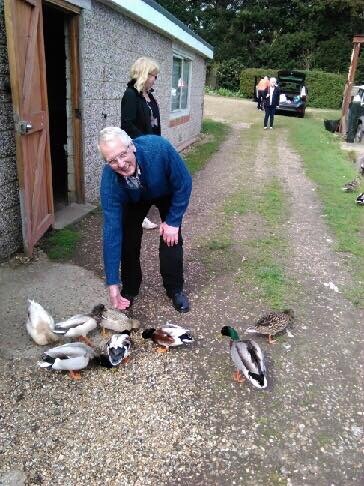 I’m really looking forward to visiting Parkwood Trout Farm today to see Mrs Ducky and her friends. 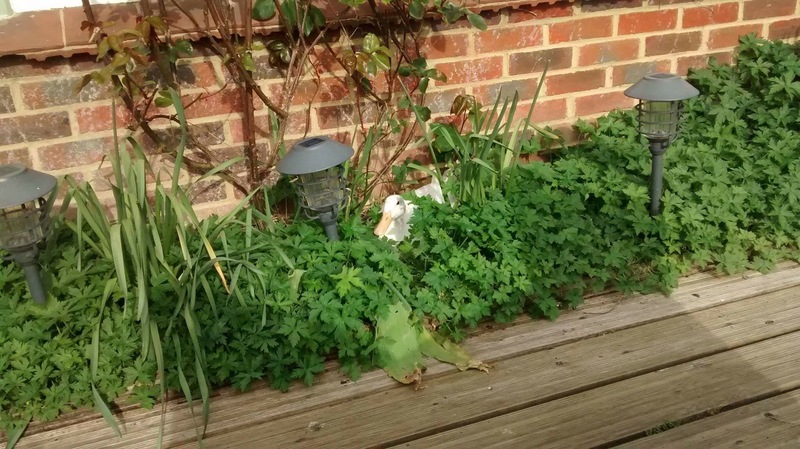 Here is the next instalment of Mrs. Duckys’ adventures…. 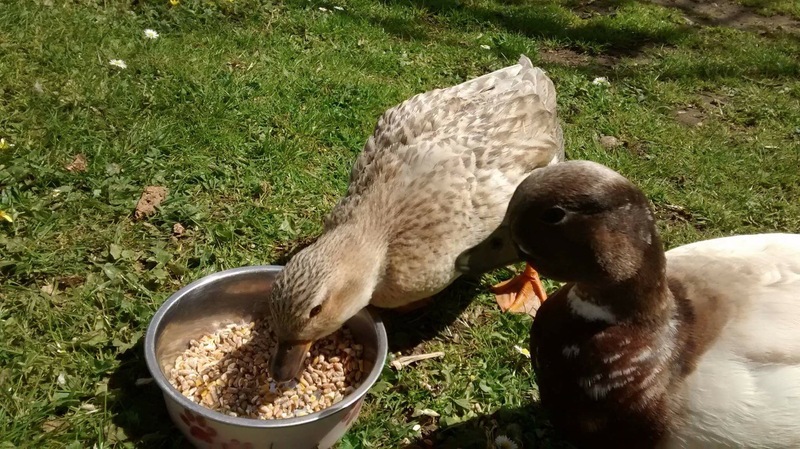 Today, it was lunchtime dining for two, as Mrs. Ducky was joined by her partner, for a bit of lunch in the afternoon sunshine. Lovely afternoon for dining out in the sun! I’m looking forward to visiting on Sunday! So endeth the tales from the countryside for today! 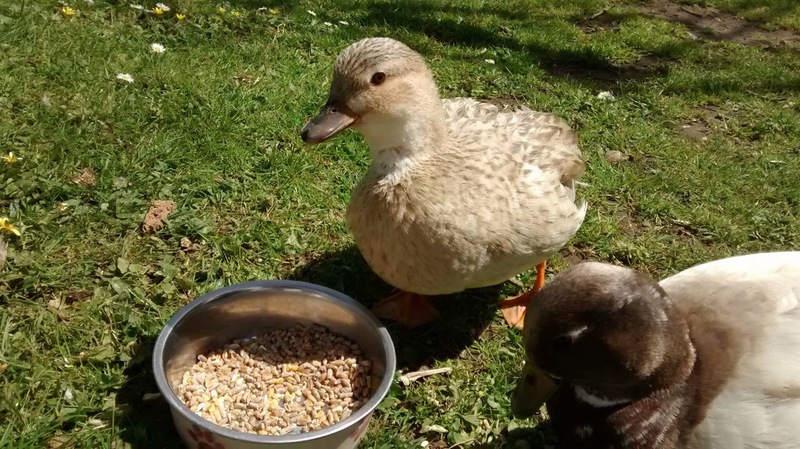 You may recall my visit to the Parkwood Trout Farm in Harrietsham a few weeks ago when I met up with an old feathered friend, a particularly tame Call Duck. She also likes her food! 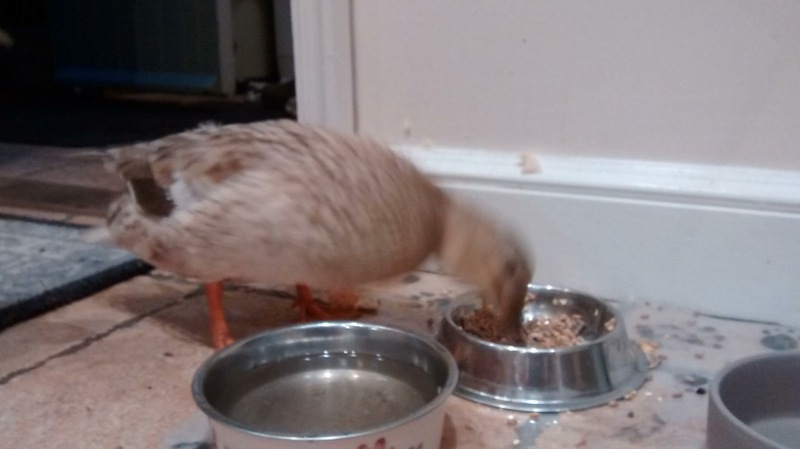 She also does what Call Ducks do and created a bit of a panic by disappearing for a couple of days. 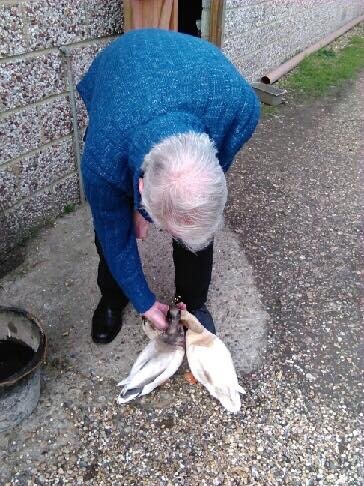 My great friends Alison and Paul spent frantic days trying to find her but finally decided to tell me that Mr Fox had done his dastardly deed. After telling me that, they found her nesting in the base of a tree brooding over a clutch of eggs. 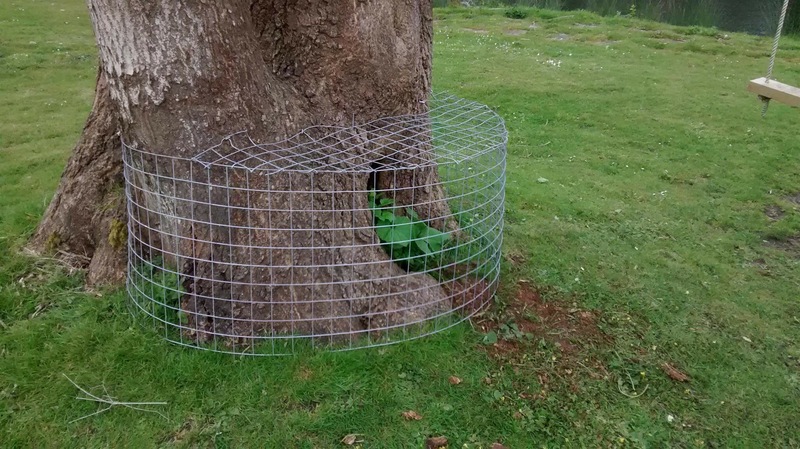 Paul ensured that her nest was well and truly protected. 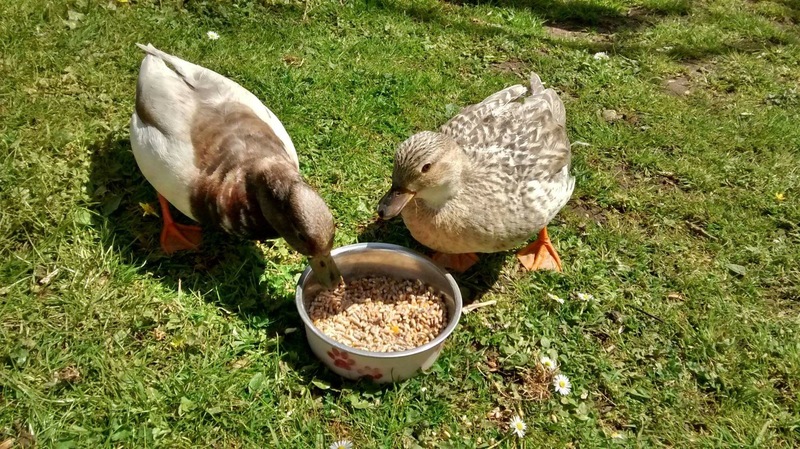 Next instalment of Mrs. Duckys’ adventures…. 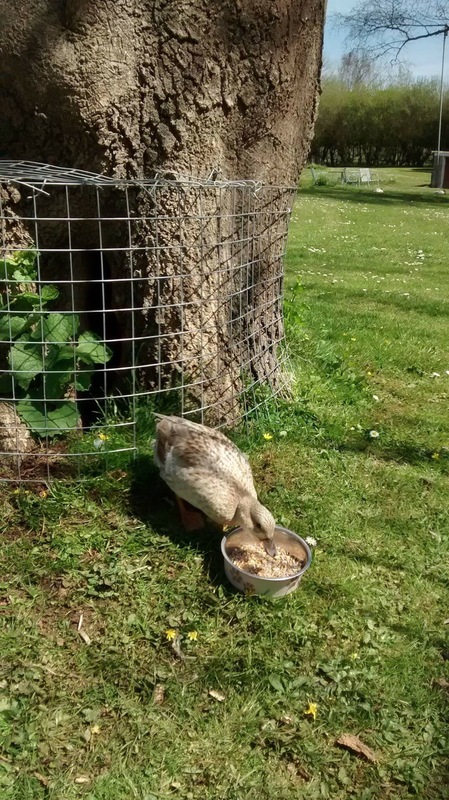 It’s going well, she now knows I’m bringing her some food each day, so we have a good system working now! Lunch time was a bit earlier today, 1.30pm & out she popped straight away (with an audience of our favourite anglers who are nature lovers). 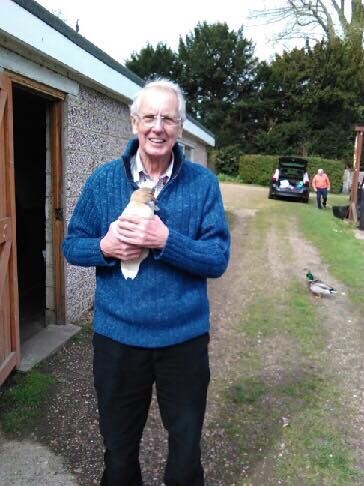 Lunch, quack for the old man, a trot down to the lake, quick swim & a preen & back in 10 minutes. 18 days to go to hatching and I’m sure that there will be many more adventures to follow and I will keep your posted! Medway Council will shortly be carrying out works to replace highway drainage covers at the above location from SUNDAY 15 MAY 2016 for 1 day, between the hours of 7AM and 7PM. The junction of Maidstone Road and Herbert Road will be closed for the duration of the works. Temporary traffic lights will be installed on Maidstone Road during this time to allow the works to be carried out safely. An appropriate diversion route will be put in place and access to properties maintained where possible and where safe to do so. The Council will make every effort to complete the work within the dates given, however the date may be subject to change if the Council experience poor weather conditions or other issues arise within the working area. Having just started in his new role as Head Teacher of the Howard School in Rainham it was a real pleasure to be visited by Terry Millar this morning where he brought both myself and my ward colleague Cllr Barry Kemp up to date with his plans for the future of the school. Terry joins us from the Haberdashers’ Aske’s Crayford Academy and I know is extremely excited at his new role with us here in Medway. After discussing local ward issues I was able to spend time with Terry discussing various issues and really look forward to working with Terry and the leadership team at the Howard School in the future. 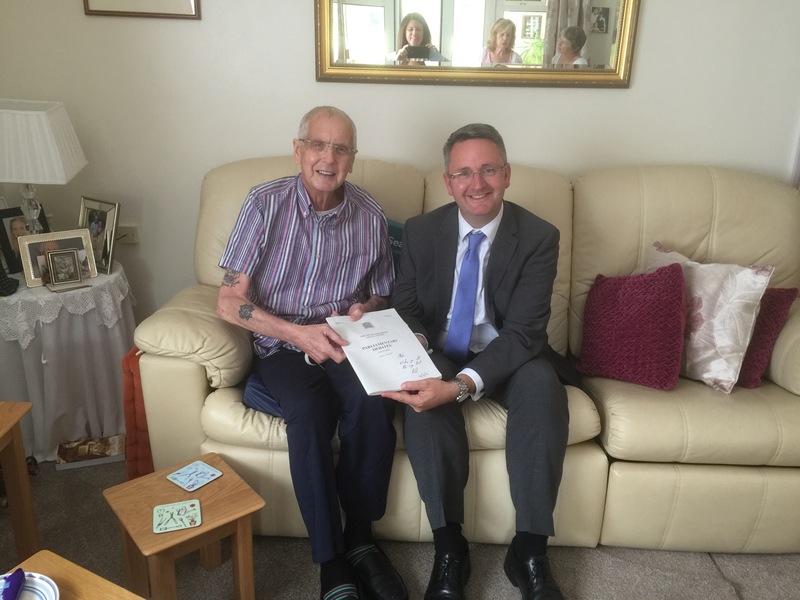 Thank you Terry for taking the time to visit, it is very much appreciated. Six beacons in Medway will burn bright on 21 April as part of a national salute to the Queen on her 90th birthday. To make the occasion special for local people, we’re inviting residents to enter a competition to light Medway’s main beacon at Great Lines Heritage Park in Gillingham, together with the Deputy Mayor of Medway Cllr Steve Iles. There is a long and unbroken tradition in the UK of celebrating Royal jubilees, weddings, coronations and special birthdays with the lighting of beacons. The last major beacon celebration marked the Queen’s Diamond Jubilee on 4 June 2012. To enter the Medway beacon lighting competition, head to Twitter, use #MedwayBeacons and in one tweet tell us why you should be chosen to light the Great Lines’ beacon. The winner will be contacted on Twitter by the official Medway Council Twitter account (@Medway_Council) on Tuesday, 19 April. Entrants must be over 12-years-old, must live in Medway and be willing to have their photo taken. Photos may appear in the local media, or in council material including social media. The winner will need to arrive on site no later than 8.10pm, ready for the lighting ceremony at 8.30pm. Deputy Mayor of Medway, Cllr Steve Iles said: “I am very much looking forward to lighting the Great Lines Heritage Park beacon to mark the Queen’s 90th birthday. It’s a special occasion set to be celebrated nationwide and I am pleased I’ll be lighting a beacon alongside the winner of the competition, as well as hundreds more people up and down the country. 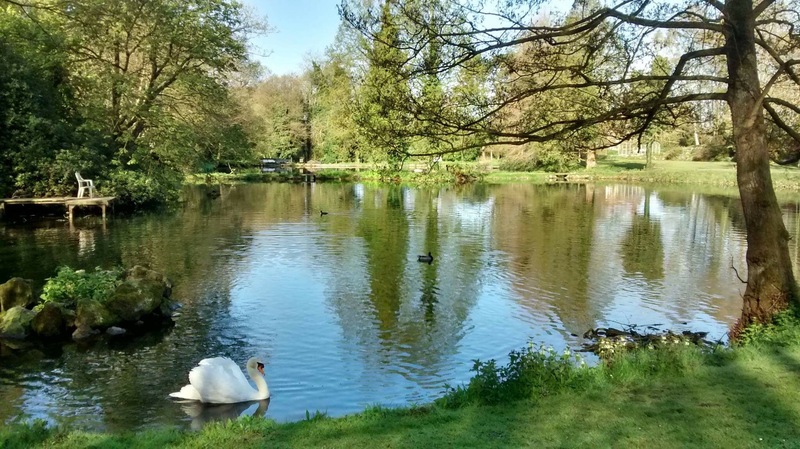 Mike writes in a personal capacity only and the views expressed on this blog should not be seen as official council or Conservative Group views.